What Are the Best Short Term Investments for Your Money? You work hard to put as much money as possible into your savings account, knowing you can earn interest safely. After putting in as much money as you can, you check your savings account interest rate. The current 0.1% on your savings account balance isn’t going to earn you much interest. Short term investments are useful for saving toward a house, education expenses, or a home, but traditional savings accounts aren’t doing consumers much good. While often difficult and volatile, these investments can generate the funds you need to reach your financial goals. Although our current financial market is volatile and unpredictable, there’s never been a better time to take advantage of short term investments. Long term investments build wealth through the magic of compounding interest, while short-term investments allow you to gain interest without tying up your money for decades. With so many short-term investment opportunities out there, we’ve decided to list our top short-term investment recommendations that make the most of your money. Check out even more ways to grow your money and reach your financial goals. Before we list our recommendations, it’s important to at least have a basic understanding of short term investments and how they can be useful. Short term investments are typically defined as investments that will need to be liquidated within five years of the original investment date. These investments can be used for purchases or moved into a long-term investment account. The key is to not let the investment run too long, and fortunately, these short term investment options that we recommend very rarely allow investments to last longer than that. Choosing short term, stable investments keeps your money safe. Here are some top short term recommendations you can use to meet your financial goals. A certificate of deposit (CD) is a very stable short term investment that gives investors multiple options for returns and time commitments. You can choose to invest your money for just a few months or multiple years. The longer you invest your money, you’ll typically get a higher rate of return. Certificates of deposit are also a good investment option if you do need to liquidate your investment early in case of a financial emergency. While there are often penalties associated, your money isn’t completely locked up as many people may think. It’s always best to keep your money in the CD for the entire length of the investment period to avoid penalties and potential losses. However, since you can choose the length of your investment, you can plan your finances accordingly and select the investment length that makes the most sense for your financial goals. CDs that are taken out through your financial institution are FDIC insured, and rates of return can be as high as 3.5%. While that may not seem like much, the benefit of investing in a CD is the stability of the investment, making it one of the lowest-risk investment options available. The average interest on a traditional savings account is just under 0.2%, which doesn’t provide much return, even for high savings balances. With the rise of online savings accounts, savings account interest rates are now as high as 2% or more, allowing you to make the most of your hard-earned money. These rates are ideal for investments that are short-term because they’re stable, reliable, and very low-risk. Many online banking institutions regularly raise their interest rates, giving you even more bang for your buck. By eliminating brick and mortar operations costs, these banks pass savings on to consumers. Here are some easy ways to save money to put into your high-yield savings account. Betterment is changing the way that people invest their money. As the leading robo-investing platform, Betterment currently has over half a million members and manages $11 billion in investment assets. Investing can be complex, and when it comes to short-term investing, you rarely have a second chance to get it right. Betterment takes the stress out of short-term investing and manages your investment portfolio on your behalf to maximize your returns. Both new and experienced investors can use the team of experts at Betterment to realize higher rates of return. The Betterment platform manages your investments on your behalf, allowing you to focus on your big-picture financial goals without worrying about micro-managing your investments. After you sign up for Betterment and link your account, you’ll answer a series of tailored questions based on your personal financial goals. These questions allow Betterment to create a personalized investment strategy plan. Review your investment plan and make adjustments as needed through the dashboard. Betterment provides regular investment checkups to ensure that your portfolio is aligned with your investment preferences and is on-track to reach your investment goals. The Digital plan has a 0.25% annual fee, a $0 minimum balance, and a robust lineup of services, including personalized support, automatic rebalancing, and multiple portfolio options. The Premium plan has a 0.40% annual fee and requires a minimum balance of $100,000. This plan is ideal for serious investors who need in-depth financial analysis reports, world-class support for all investment accounts, and unlimited, on-demand access to financial experts. Click here to make the most of your money by signing up for a Betterment investment account today. Betterment is proven to provide higher returns than traditional investors. In fact, recent benchmarks put Betterment at more than 2% more interest-earned than other portfolio-management companies. Through the power of smart, automated rebalancing, your portfolio will be adjusted based on market trends and personal finance preferences. Here are some more top investment apps you can use to grow your money. Every time you make a purchase using your debit card, you can round up your purchase and invest your spare change using Acorns. Simply link your bank account and debit card to the Acorns site, and you’ll start building your investment account automatically with every purchase. Rounding up your purchase to the next dollar can quickly add up. Rather than investing a large amount of money up front in a short term investment product, you can quickly build your investment portfolio each time you shop. Once you set up your account, you can manage your portfolio, review your investment balance, and withdraw your funds right through the app. As we mentioned, Acorns rounds up your purchase to the next dollar and invests that difference. For example, if you make a purchase that’s $4.25, the total is rounded up to $5.00 and $0.50 is invested in your Acorns account. You’ll have the opportunity to select the investment portfolio that matches your personal financial goals and risk tolerance. With five portfolios to choose from, you can invest as aggressively or as conservatively as you’d like. When it comes to quick investments, Acorns is a great way to invest without actively investing or managing your account. You pay just $1 per month on balances under $5,000, which is very low for expert investment-management services. Click here to start investing your spare change with Acorns. Although Acorns is a relatively new platform, initial return analysis is promising, offering investors an average of 6-10% annually on investments depending on the selected portfolio. The portfolios that Acorns offers are hand-selected by financial and investment experts, meaning they’re proven portfolios that will maximize your investments. For rapid gains and simple automation, Acorns is the perfect way to quickly save for your future. Click here to sign up for Acorns and automate your investments. Aspiration is a full-service online banking platform that provides a wide range of financial products including savings accounts, investment accounts, and even opportunities to give back to your community. The site also offers short term investment opportunities with competitive rates of return, in addition to high-yield savings accounts. Founded on principles of sustainability and corporate responsibility, Aspiration not only provides consumers with competitive financial products, but is also making a positive impact on the environment. Aspiration offers two investment portfolios, the Redwood Fund and the Flagship Fund. The funds require a minimum investment amount of $100 and are open to new investors. The Redwood Fund is an investment portfolio that targets companies who are making positive impacts on the environment through sustainable business practices. Studies have shown that companies that focus on corporate, social, and environmental responsibility grow faster than companies that do not. The Flagship Fund is a steadier investment strategy that is targeted toward long-term growth. While this fund may not be ideal for a short term investment option, it still only requires a minimum of $100 and is a stable mutual fund providing consistent returns. This may be a better option if you have a large amount of money to invest and have lower risk-tolerance. While short-term gains may not be as lucrative as the Redwood Fund, the Flagship Fund does provide investment stability that conservative investors are looking for. Finally, you can open a high-yield savings account that nets you 1% annual interest and comes with zero fees. Click here to sign up for Aspiration to make sustainable investments with fantastic returns. FutureAdvisor is another leading robo-investment firm that can help you automate your savings, investments, and spending to meet your financial goals. For easy investment opportunities, FutureAdvisor can take the stress out of investment management and maximize your returns. What was once only available to the ultra-rich is now available to virtually anyone looking to invest their money. These investment management services also come at a fraction of the cost of traditional investment advisors. Through intelligent investing and investment automation, you can make the most of your investments. Signing up for a FutureAdvisor account is simple and straightforward, meaning you can start your investment journey in just a few minutes. After you sign up, you’ll answer a series of questions to create a personalized investment strategy. After funding your portfolio and linking your accounts, you can fully automate your investment strategy. That means setting up automatic deposits, reviewing rebalancing preferences, and setting up alerts for your investment portfolio. You don’t have to worry about managing your portfolio. The team at FutureAdvisor uses artificial intelligence and a team of investment experts to automate and manage your portfolio on your behalf. Click here to sign up for FutureAdvisor and make your investment strategy stress-free. Money market accounts are currently offering very competitive interest rates, similar to those that you’d find in a CD. A major benefit of opening a money market account as your short term investment option is the fact that you’ll have immediate access to your funds if needed. A money market account is similar to a savings account, and you’ll receive an ATM card and checks for access to your money. You can use your money market account in conjunction with your CD. You can move your money in your CD account to a money market account to take advantage of a higher interest rate. Money market accounts are secure, stable investments that are ideal for short-term growth, as long as you don’t touch the money in the account and let the money grow. Some money market accounts are currently over 2% annually. Check out other ways to grow money quickly with these tips. Anyone who has researched investment options knows that bonds are some of the most secure and stable investments available. While higher-risk than savings accounts and money market accounts, bonds often result in a much higher rate of return. Bonds typically pay out in monthly interest installments and are used as an income-supplement. When thinking about short term investments, investors can re-invest the interest-earned and maximize investment growth potential. While you typically need a brokerage account to invest in a short term bond, it’s well worth it. Most bonds mature in just a few short years, making them ideal for rapid financial growth. Here are more creative ways to make the most out of your investments. While reducing high-interest debt isn’t a direct investment, it can actually be the most effective way to grow your money. 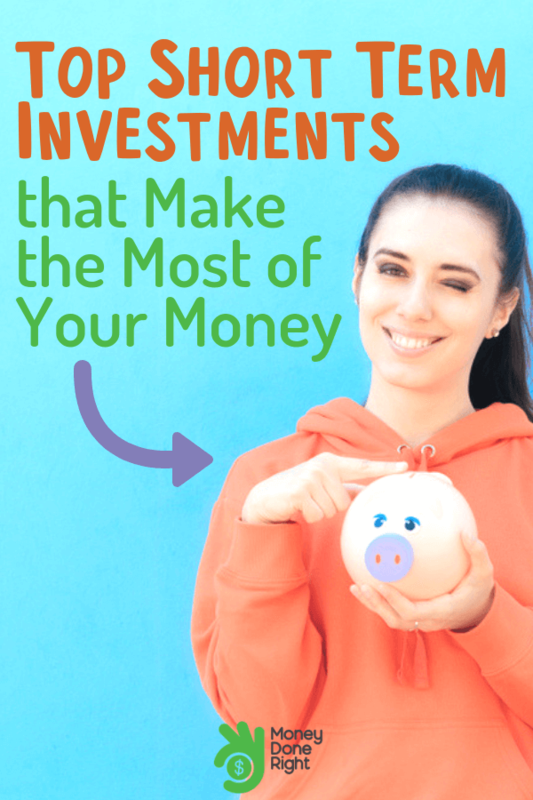 When comparing investments versus paying off debt, it’s much better to pay off $20,000 in debt with 15% interest, for example, than it is to invest $20,000 at a 5% rate of return. In fact, there are virtually no investments that guarantee the same rate of return as paying off high-interest debt. Paying off high-interest debt is the same as an investment with a return at that same high interest rate. Not only are you getting a great rate of return, you’re saving money in monthly expenses. You can use that extra income to invest and earn even more. Reducing high-interest debt is not as difficult as it sounds, and there are plenty of tools out there that you can use to manage your debt and create an aggressive payment strategy. Check out these top tips for paying down debt fast. With most credit card interest rates at a staggering 20% or more, it’s easy to see how consumers can become completely overwhelmed with credit card debt. If you’re struggling to make your credit card payments or feel burdened by your debt, a credit card balance transfer may be a good option for you. These offers provide a 0% interest rate for a set period of time, typically between 6 and 21 months. That means you won’t pay any interest on your balance in the promotional period, which can make it much easier to pay off your debt. If you don’t want to shuffle your balances between multiple cards, a personal loan is another option to help reduce your interest payments. Personal loans consolidate your debt into one low, easy monthly payment. Most personal loan providers offer rates starting around 5%, which can save you thousands of dollars in interest. Here’s what you should know before opening your first credit card. Student loans can be incredibly difficult to manage, with interest rates as high as 10%. If you have student loans with high-interest, refinancing may be a great option to not only lower your monthly payment, but reduce the amount you owe over the life of the loan. LendEdu is a platform that connects borrowers with a network of refinancing companies, allowing consumers to browse for the best rate and payment term for them. Click here to see even more ways to refinance your student loans. As you can see, there are plenty of ways to generate large returns on a short term investment. No matter what you’re saving for, there’s a short term investment product out there that’s right for you. Have a short term investment success story you’d like to share? Let us know in the comments! For more investment opportunities check out these additional resources!